“While We’re Young” opens Friday at Sundance Cinemas. R, 1:34, three and a half stars out of four. If youth is wasted on the young, middle age is definitely wasted on the middle-aged. Think about it. You have the experience and wisdom to know what truly matters, and the resources to go after it. And yet you waste all this time either mooning over your vanished youth or living in fear of the old age to come. Or waste time hunting around for the cardboard sleeve to your “Yankee Hotel Foxtrot” CD. That Wilco joke cut awfully close to home in Noah Baumbach’s funny and incisive “While We’re Young.” The film is sort of a do-over of Baumbach’s marvelously prickly “Greenberg,” which was another ode to mid-life disappointment. 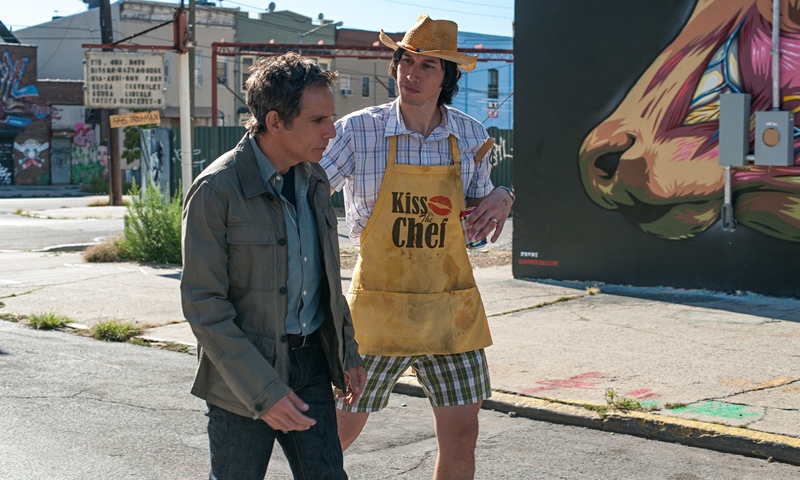 “While We’re Young” takes another go at it, again with Ben Stiller, only this time in a film that has the jokes and contours of a mainstream comedy, albeit with some uncomfortable honesty strewn in among the laughs. Stiller plays Jack, a New York documentary filmmaker who’s been caught in a sinkhole of a project for almost a decade. His wife Cornelia (Naomi Watts) is a film producer and the daughter of a truly famous, D.A. Pennebaker-level documentarian (Charles Grodin). Watching their friends have kids and seeming to move seamlessly into adulthood, Jack and Cornelia feel left behind. Then they befriend Jamie (Adam Driver) and Darby (Amanda Seyfried), a free-spirited DIY hipster couple in their mid-20s. Jamie makes little movies, Darby makes artisanal ice cream, and their spacious loft is full of little projects and oddities. They seem obsessed with VCRs, bad ’80s music, forgotten bits of pop culture; everything Jack and Cornelia lived through the first time, Jamie and Darby re-appropriate for their own generation as a sort of a kitschy renaissance. One of the funniest scenes in the movie is Jamie’s insistence on not Googling something, just to bask in the ancient feeling of “not knowing.” Back in the day, we just used to call that not knowing. Jack and Cornelia are re-energized by hanging out with the young couple, and “While We’re Young” turns into an astute comedy of manners. Baumbach is absolutely writing from the middle-aged perspective; he feels (even as he skewers) Jack’s desperation to hang onto his last shreds of coolness, while Jamie and Darby seem (at least initially) like satiric manifestations of the Bushwick class. Also weaving through the film is much talk about what constitutes “real,” from the line between fiction and reality in documentaries to the line between passion and pose in everyday lives. You’re always playing a version of yourself — is the key to happiness just a matter of picking the right version? This is my favorite Ben Stiller mode, where he is able to tamp down his neurotic comedic gifts and tether them to something real. And Watts, although her character isn’t given quite enough to do, is fierce and funny as Cornelia, especially in a scene where she gets dragged to both her friend’s “Baby Disco” class and Darby’s hip-hop dance class. Seyfried is also underused as Darby, but Driver is a revelation as the loose-limbed, seemingly earnest Jamie, who may be way too comfortable in his own skin. Jamie’s life seems to be one giant art project, and he moves through it with a complete, unearned confidence and ease. But, as the last shot in the film suggests, Jamie’s turn at middle-aged wistfulness will come soon enough. “While We’re Young” is clever and sharp, but it’s also uncommonly generous for a Baumbach film towards all its characters. That kindness must be a byproduct of getting older.